It's fall and I am here for all things caramel and fall treats. I really do enjoy a warm or cold, cup of cider. I've even made it homemade with some fresh apples from the orchard. I was pleasantly surprised when I went to a Dollar Tree in my state while adulting and seen that they carried it. Seeing how apple cider sells for typically $4 and up. I was like a kid in a candy store seeing it for a $1. Seeing how I do enjoy the apple juice and it's made at by the same brand. I was excited to try it. I must say that this recipe is so yummy. So yummy that I think I'm going to indulge in some once this post is live. I may even sprinkle some cinnamon on the top of the whipped cream next time. Warm the apple cider on the stove top to your desired temp. (this should not take long) You do not want to bring it to a boil. You simply just want to warm the cider up. Add your desired amount of whipped topping on top of the cider. Drizzle your favorite caramel sauce on top of the whipped topping. Now this is something I know I can do! I bet my husband would love it. I'll put it together for Sunday football. One for me minus the cream please. Yummy for a wintery evening. So simple and delish! Can't wait to try it :) Maybe for pre-thanksgiving? hehe! Okay, this looks SO amazing! I need to try it. This sounds amazing!! We have really started to make our own drinks at home and this sounds like one everyone would love! I had to go google what cider is lol.... But besides for that hiccup, the recipe seems worth to ty out. 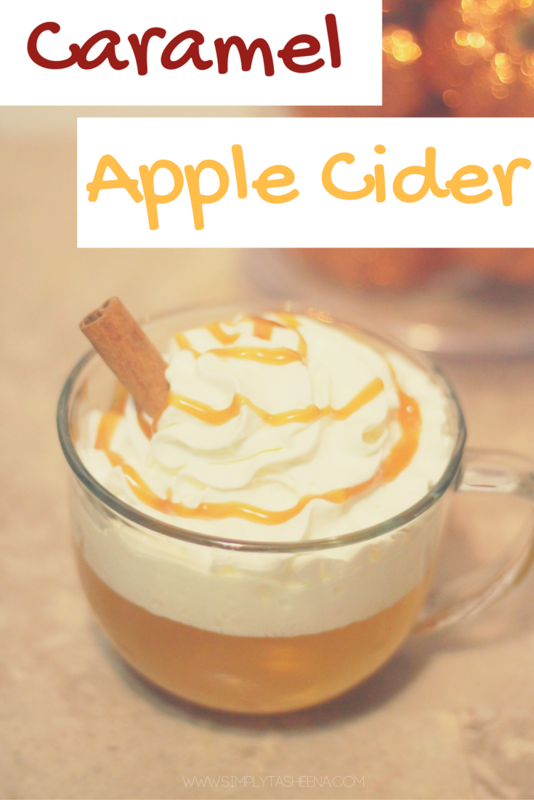 Perfect drink for a cold fall night and so easy to make too. I will be trying it soon! You weren't kidding about the easy part! It's funny that I've never tasted apple cider before, it's not something that we have a lot here in the Philippines. I would love to try this recipe though especially since it has caramel. This is awesome. I love easy recipes because I won't have a difficult time making them! Thanks for this, it's the perfect drink for the season! This looks yummy and beautiful! Love it! HAHA I just want to swim in this! Thank you for sharing in the Sips and Sweets linky. Hope to see you at the Twitter party. Off to Aldi for that caramel sauce!